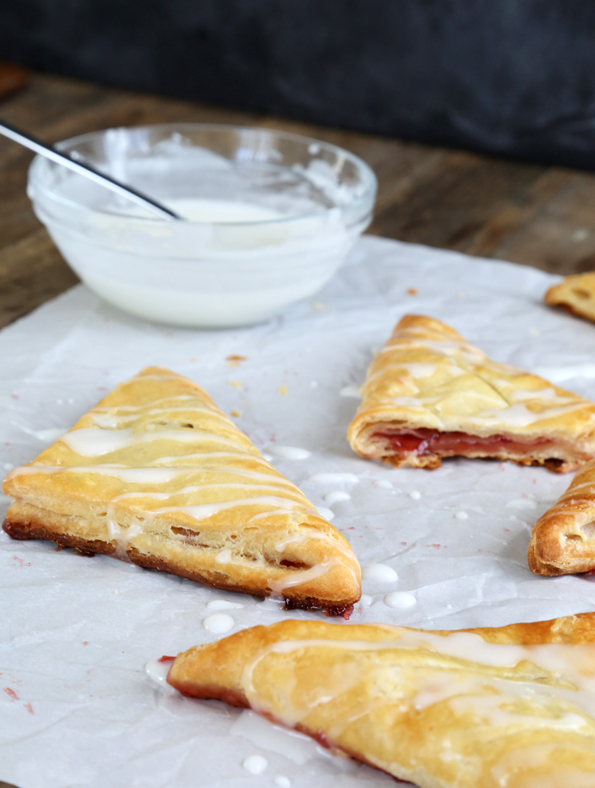 Easy Gluten Free Cherry Turnovers | Great gluten free recipes for every occasion. [pinit] It’s no secret that I’m hopelessly devoted to gluten free biscuit dough. As far as I’m concerned, it can do pretty much everything. Oh, you need proof? Two words: Biscuit Donuts. I always always always have a batch of the Extra-Flaky Buttermilk Biscuit dough from page 227 of GFOAS Bakes Bread in my refrigerator or freezer (don’t have the book? use this gluten free biscuit recipe from the blog—it’s fabulous too!). Sometimes, I’ve already shaped it into biscuits and I can just pop those right in the oven for dinner, or even bake them over some ground beef and make a quick shepherd’s pie sort of deal. Other times, the dough is frozen in a rectangle and all I have to do is leave it in the refrigerator overnight to use the next day however I like. And one of the ways I really really like to use it? 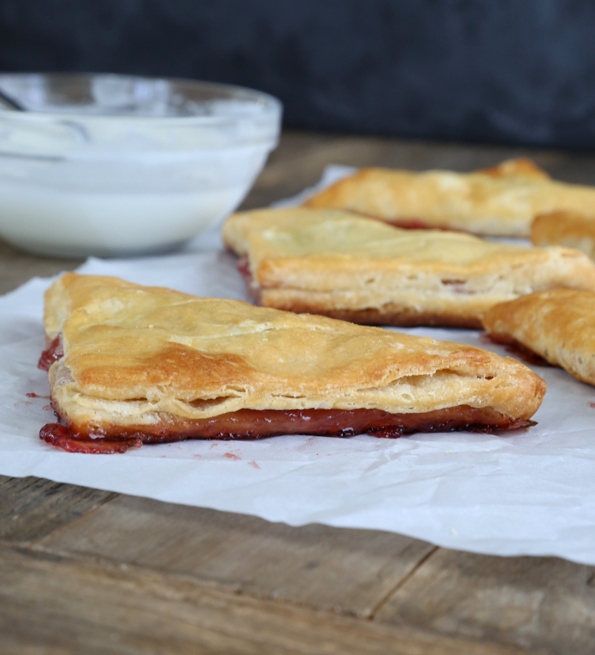 The quickest and easiest gluten free cherry turnovers you’ve ever seen. That’s how. 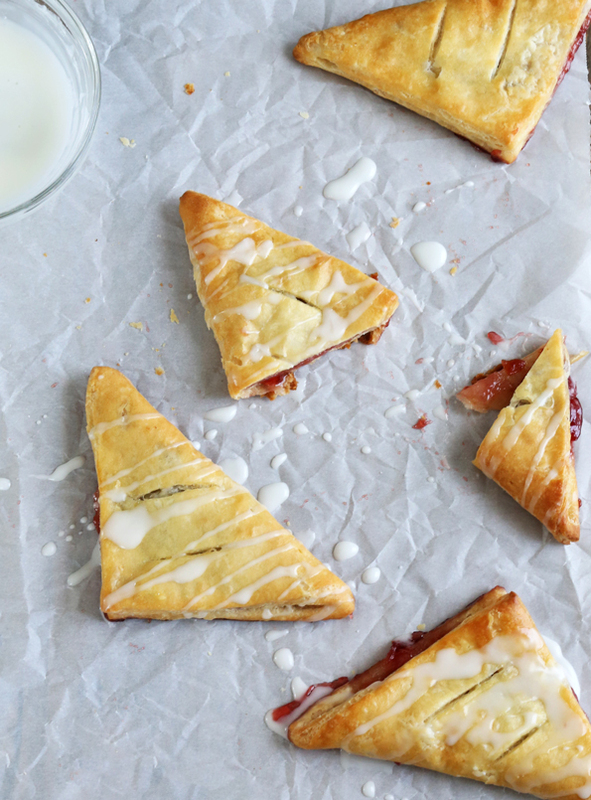 Light and flaky, and filled with good cherry preserves, these turnovers only take a few minutes to throw together but you’d never know it to look at ’em. Since cherries aren’t in season yet, and in the name of making things as easy as humanly possible, I went with preserves. Preserves are like jelly or jam, but they’re not smooth. They have chunks of fruit. As far as I’m concerned, that makes preserves basically the same as pie filling, just with fewer ingredients. Sold! Have I convinced you yet of the magic that is biscuit dough? C’mon. Keep some on hand and I bet you’ll sleep better at night! Your skin will be glowing! Your children will be well-behaved! Your partner will whisk you away on a romantic weekend getaway! Shape and fill the turnovers. With a sharp knife or pastry cutter, slice the rectangle of dough into 4-inch squares. Gather and reroll scraps. 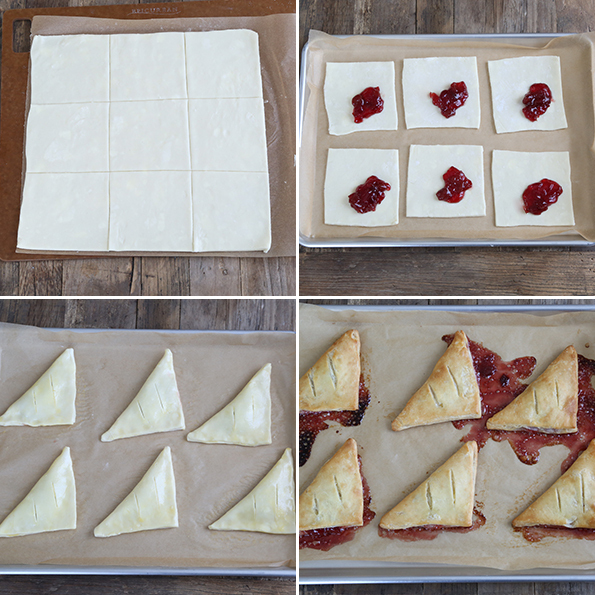 Separate the squares from one another and place 2 teaspoons of cherry preserves on top of each square, slightly off-center so the filling is enclosed when the dough is folded, not caught in the fold. Moisten the edges of each square with a wet finger, and fold each square of dough in half diagonally to creat a triangle, gently pressing out the air as you fold. Press the edges of the triangle to seal and, using a sharp knife or pastry cutter, slice two vents on top of each turnover. Place the turnovers an inch apart on a prepared baking sheet, and place in the freezer until firm. Bake the turnovers. Remove the chilled turnovers from the freezer and brush each generously with the egg wash. Place in the center of the preheated oven and bake until the turnovers are puffed and pale golden all over, and more brown around the edges (about 15 minutes). The filling will almost certainly leak a bit. No problem! Remove from the oven and allow to cool slightly. Make the glaze. While the turnovers are cooling, in a small bowl, place the confectioners’ sugar and 1 tablespoon of milk. Mix well, until a thick paste forms. Add more milk by the 1/4-teaspoon, mixing to combine well, until the glaze falls off the spoon slowly, in a thick but pourable glaze. Add milk very slowly, as it is much easier to thin, than to thicken, the glaze. If you do thin it too much, add more confectioners’ sugar a teaspoon at a time to thicken to the appropriate consistency. Drizzle the cooled turnovers with the glaze and serve. Inspired by Taste of Home, as selected by you from my Must Make Gluten Free Pinterest board. P.S. If you haven’t yet, please pick up your copy of Gluten-Free on a Shoestring Bakes Bread. Your support means so, so much to me and we’re gonna bake bread this summer without heating up your kitchen. You’ll see how soon!! Can you put them in the freezer after you make them? Definitely, Gfmomma. Then defrost in the refrigerator and pop ’em in the toaster like pop tarts to refresh. Today will be planting day so the dough has to wait… maybe Thursday, I have a school field trip Wednesday… School is fast approaching its end and the field trips begin! Okay so where’s the camera hidden? I have some frozen cherries from last years bumper crop, have to use them up soon, right? Nicole…how did you know I was looking for cherry turnover recipes? Really these look amazing! My task today is Potato Bread from your first book, currently letting the ingredients to warm up… Hopefully tomorrow I’ll have some time too make the dough for these lovely’s. As I write this hubby has gone off to pick up 50 cherry trees to plant tomorrow. Jubileum and blackgold varieties so I’ll have many cherries to bake with… yum! It might make sense to do a tutorial of just the basic “turns” of puff pastry (and other pastries like these biscuits). It can be kind of confusing to explain using just words. Maybe this summer after I turn in my manuscript for my next book! We have a small cow and calf operation, we raise them naturally grass fed, no hormones etc. (really could say organically except not certified) we have the land and decided this year to plant 350 trees (peaches, pears, apricots, cherries) to start. We want to get into the Farmer’s Market. Lots of hard work, but so worth it, we are working to become certified which we should be in three years. Just made these! First customer returning from an AP Bio exam gives them the thumbs up! Didn’t even wait for the glaze! Nicole, you have made going gluten free a breeze! Thanks to you, my family of seven is feeling terrific and enjoying all of your delicious recipes! We simply cannot thank you enough! Really. That’s so wonderful to hear, Deb. Thank you so much for saying that. A family of 7, huh? You sound like supermom!! Of course you are a genius and yes, I have that biscuit dough in my freezer at all times too! Oh definitely, Jennifer. Please don’t tell my kids that your kids get things like that for breakfast on a school morning though. Mine are lucky if they get oatmeal! Yum, turnovers! I make several kinds of jam, so I have jars of things with which to experiment! I’ll bet lemon curd would be delicious, too. Thanks for this! So fancy, Michelle. These would be amazing with lemon curd. Maybe even add some zest to the biscuit dough.